Properties in Nosara Wildlife Rescue average 4.7 out of 5 stars. L@@k! Downtown Samara, only two blocks from the beach! Property 3: L@@k! Downtown Samara, only two blocks from the beach! Costa Rica Paradise Right on the Beach!!! 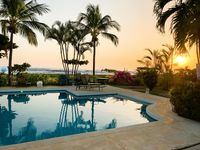 Property 4: Costa Rica Paradise Right on the Beach!!! Awesome Ocean & Beach Views of Beautiful Samara, Costa Rica - WALK TO BEACH!! Property 8: Awesome Ocean & Beach Views of Beautiful Samara, Costa Rica - WALK TO BEACH!! Property 11: Heaven On Earth! Perfect Get-Away! Gorgeous Beach. Pool. Couples &/or Families. Namaste Oasis: surf, sleep, eat, repeat style.Close to the beach, surf and yoga. Property 13: Namaste Oasis: surf, sleep, eat, repeat style.Close to the beach, surf and yoga. Breezy, Ocean View Condo with A/C & Pool! Property 14: Breezy, Ocean View Condo with A/C & Pool! Escape to Luxury. Beach & Ocean Views, One of a Kind in Playa Sámara. Book Now! Property 15: Escape to Luxury. Beach & Ocean Views, One of a Kind in Playa Sámara. Book Now! Luxury Condo with Large Pool, walking distance to beach to pristine Beach. Property 18: Luxury Condo with Large Pool, walking distance to beach to pristine Beach. Million dollar view! Great location. Property 20: Million dollar view! Great location. Don’t miss this incredible view! Property 29: Don’t miss this incredible view! Unique 4th Floor Penthouse Getaway, Stunning Views, Steps To Sand, NEW! Property 33: Unique 4th Floor Penthouse Getaway, Stunning Views, Steps To Sand, NEW! Beautiful Condominium - 300 Yards from the Beach! Property 34: Beautiful Condominium - 300 Yards from the Beach! Luxury Condo with Large Pool, Ocean View, Secluded Beach. Property 41: Luxury Condo with Large Pool, Ocean View, Secluded Beach. Best Beach View in the World! So Close You Can Hear the Surf! Property 45: Best Beach View in the World! So Close You Can Hear the Surf! Ocean Views in Playa Azul - large 2 bdrm condo steps from the beach! Property 47: Ocean Views in Playa Azul - large 2 bdrm condo steps from the beach! All the Amenities with a Truly Tico Flair! 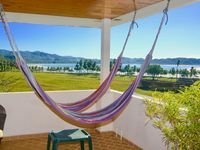 Property 49: All the Amenities with a Truly Tico Flair! Alta Vista - Two Thumbs Up! This was our second year to visit S&aacute;mara for Spring Break. Two years ago, we stayed at a condo in the heart of town, which was very convenient to the beach and restaurants, but also pretty noisy. This year, we stayed at Alta Vista, and it was wonderful. The condo was spotless, with good wi-fi, good A/C, very large rooms, modern design, and terrific views of the ocean from the front deck, master bedroom, and living room, and looking into the trees full of monkeys from the dining room and back bedroom. Highly recommended.